As hoped, this week’s divisional round NFL playoffs featured plenty of action, so here are the top plays that got our attention. The LA Chargers were completely blown apart in the opening thirty minutes by the New England Patriots in Foxborough, as the home team piled on a staggering 38 points. In one of the few first half highlights for the Chargers, quarterback Phillip Rivers spotted receiver Keenan Allen, who had snuck out the back of the defence, and unleashed an absolute bomb. Sadly for the Chargers, they’d have to wait until the third quarter to get into the endzone again, as the Patriots claimed a 41-28 win and extended Rivers’ winless run against Tom Brady to eight games. The LA Rams ran the Dallas Cowboys into the ground at home, with recent recruit CJ Anderson – who was cut by both the Carolina Panthers and the Oakland Raiders earlier this season – rushing for 123 yards. Not far behind him was Rams star Todd Gurley with 115 rushing yards of his own, including a brilliant touchdown run before the end of the opening half. The prospect of Gurley and a Superbowl winning running back in Anderson combining is a nightmare for any opposition coach, but it’s a dream for the highlight reel. The Kansas City Chiefs’ attacking weapons arguably make them the most watchable team in the NFL, and even in difficult conditions, they were simply too much for the Indianapolis Colts defence to handle. 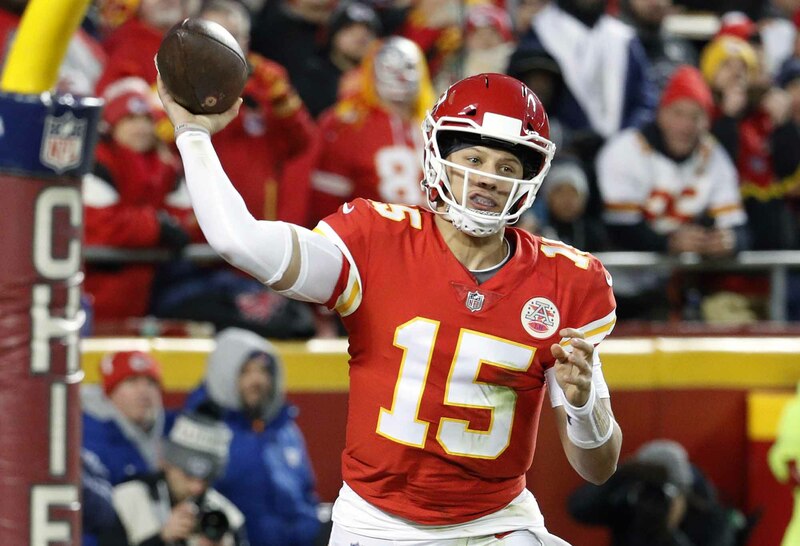 One play in particular summed up just how dangerous the Chiefs are in the hands of coach Andy Reid, as Patrick Mahomes shovelled the ball back to Tyreek Hill on a reverse rout, who proceeded to tear up the turf and send fans into a frenzy. Perhaps it says it all about the Colts’ performance that their moment of the game came from their special teams unit. Yet that doesn’t change just how good the play was. With the Chiefs forced to punt from deep in their own half, Najee Goode saw an opening and exploited it – bursting through to block Dustin Colquitt’s punt and setting up a touchdown for Zach Pascal. Sadly the moment didn’t spur the Colts on, as they went down 31-13. But as for the play of round, it was New Orleans Saints cornerback Marshon Lattimore who was the standout against the Philadelphia Eagles. The 22-year-old’s first interception for the game would turn it on its head, bringing the Saints back from the brink as they transformed a 14-0 deficit into a six-point win and even kept the reigning Super bowl champions scoreless for the rest of the contest. Fittingly, Lattimore would have the final say on the game too, with Alshon Jeffery’s spilt catching opportunity in the final moments sitting up perfectly for the young gun to latch onto. Foxtel and ESPN are bringing you more U.S. Sport than anywhere else, with NBA, NFL, NCAA Football and Basketball, Major League Baseball as well as three exclusive channels thanks to the WatchESPN app – SEC, ESPNU and ESPNews.